For those of us on an academic timetable, September is a good moment to look forward and back at what we have achieved and what we have planned. Here is a little illustration of what the LMS has been up to in one aspect of its work: organising an expanding range of devotional events, which are of course publicly advertised and open to all. If you like what you see, why not join us? The great Medieval Shrines to Our Lady, which were restored with such devotion by our predecessors in the Faith, are the destinations for several Latin Mass Society pilgrimages. I myself organise the annual pilgrimage to Our Lady of Caversham, in the outskirts of Reading, in Lent, once visited by Queen Catherine of Aragon; in June we go to Our Lady of Willesden, a favourite of St Thomas More, in North West London; in August we go to Our Lady of Walsingham, in Norfolk, visited by a stream of English Kings and dating from before the Norman Conquest. In the last case we go on foot from Ely, 55 miles of prayer for the conversion of England. In October we return to the restored Carmelite Priory at Aylesford, where we honour Our Lady of Mount Carmel, who promises such graces to those who wear the Brown Scapular. 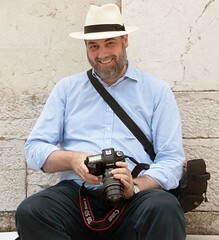 A special mention is also due to the Chartres Pilgrimage, for which the Latin Mass Society provides a number of sponsored places, to those willing to walk from Paris to the great shrines of Our Lady in Chartres Cathedral, despoiled at the French Revolution and again raised up for our veneration. 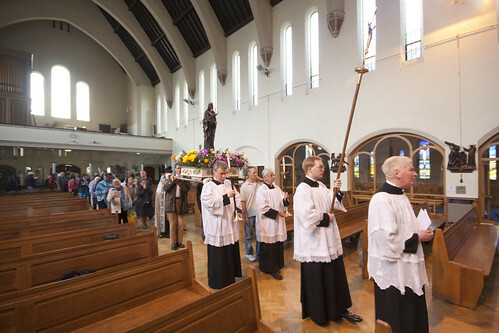 Procession for Our Lady of Willesden. Another Medieval Shrine, uniquely intact from pre-Reformation times, is that of St Winefride in Holywell, Wales, a favourite of Lady Margaret Beaufort, and we honour this in July. The hatred and destruction of the Protestant Revolt was matched by the heroism of our English and Welsh martyrs, who have given us another set of shrines to visit. We honour the Padley Martyrs in our June Pilgrimage to Padley Chapel in Derbyshire, and the Oxford Martyrs (the Catholic ones) in our Pilgrimage to Oxford, which is also something I organise as Oxford's local Representative. Glastonbury was a holy place before Bl Richard Whiting was martyred there in 1539; we honour him and Our Lady there in our annual Pilgrimage to Glastonbury in September. Similarly, at the other end of the country, we have a pilgrimage to the former Priory of Brinkburn in Northumberland, also in September. Another reminder of the days of persecution are the historic Catholic houses whose secret chapels were once a key part of the Catholic underground network. We keep this aspect of Catholic identity alive by having Masses in many of these places: Harvington Hall in Worcestershire, Wardour near Salisbury, Stonor near Henley (where St Edmund Campion was captured), and Mapledurham House and Milton Manor House in Oxfordshire. All of these places are touching reminders of the martyrs, and lovely venues for the Traditional Mass, for whose preservation their chapels were built. Also in the category is our Pilgrimage to West Grinstead, where an important Shrine to Our Lady has been built next to the old Catholic mission, where Bl Francis Bell stayed, whose secret chapel can still be visited. 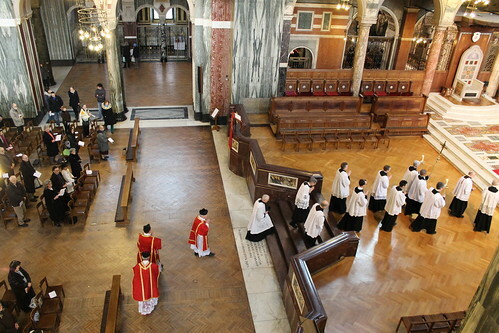 As a Catholic organisation, it behoves us to pray for our deceased members and benefactors, which we do with a splendid Pontifical High Mass in Westminster Cathedral each November. We also gather to pray together at our Annual General Meeting in St George's, Southwark, often in the company of very distinguished celebrants and guests, in 2012 we had Bishop Rifan. We have Masses in Cathedrals around the country: this year sees the revival, after a short hiatus, of our annual Mass in Portsmouth Cathedral. Overseas: as well as sponsoring the Chartres Pilgrimage, last year we had a pilgrimage to Lourdes, and this year we are having a pilgrimage to Rome. The Latin Mass Society is not the only group organising devotional events, but I don't think there is any other lay association, religious order or indeed diocese in England and Wales which can boast of such a range of events, across England and Wales and overseas. These are all, of course, events where the Traditional Mass is celebrated, often Solemn Mass with fine music. They are expanding in number, and becoming better supported musically. The Aylesford and Willesden Pilgrimages have in the last few years been revived with great success, the walking Pilgrimage to Walsingham is only in its fourth year and is growing rapidly, the Pilgrimages to Oxford and Caversham are also quite new. Wouldn't it be fun to do more? To fill in some of the gaps in the map, to go to Compostella, to do things bigger and better. With our supporters' help, we can. Does the Latin Mass Society do anything useful? Judge for yourself. And we do it as unpaid activists: with support from our staff of two and a half in London, certainly, but the great bulk of the work in organising these events is done locally. 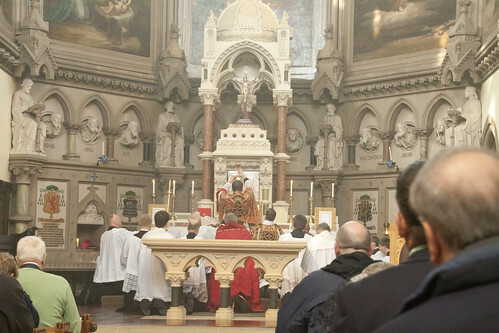 These things would not happen if it were not for the Latin Mass Society: the Traditional Mass would not be celebrated in most of these places, and certainly not for large numbers. This is all in addition, of course, to the work of local Representatives facilitating in all sorts of ways the celebration of the Extraordinary Form in parish churches every week of the year. 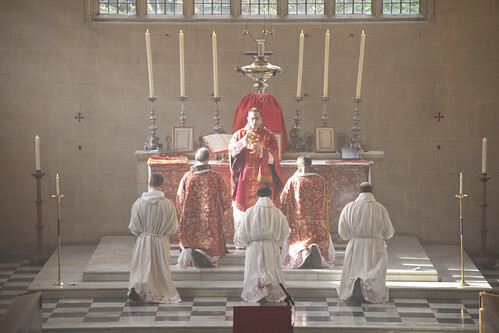 The Latin Mass Society can fairly claim to have preserved the Traditional Mass in England and Wales as a living part of Catholic life, in the dark days before the Motu Proprio, and our regular work has certainly not diminished since then. Especially, but not only, if you live in England and Wales, and care about the Traditional Mass, if you are not yet a member of the Latin Mass Society you should join us. 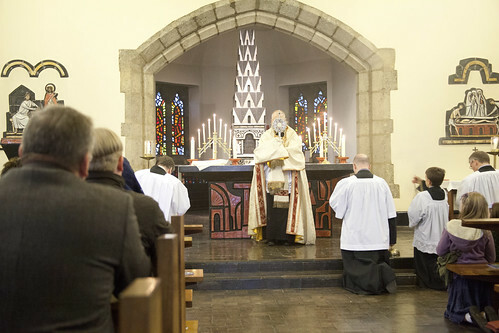 Because by joining us you are supporting this work, this vital aspect of the Catholic life of England and Wales which is the expression of our devotion to the ancient liturgy. I thoroughly repudiate that last post. God bless the Latin Mass Society for its tremendous work in these doubtful times. Well done Dr Shaw, it’s about time the LMS started to blow its own trumpet a little.